We tried this recipe for the first time the other night, and it was incredible! Everything is better grilled, but the rich pesto was truly the icing on the cake tenderloin. This would be great with a buttery Chardonnay. Slice the tenderloin into rounds of 1" thickness. Mix oils and vinegar, add garlic and ginger. Marinate the pork slices in a large Ziploc bag at least two hours or overnight. Turn periodically. Grill pork tenderloin until cooked through, approximately 15-20 mins. For pesto, blend sauce ingredients in blender or food processor until smooth, adding coconut milk until preferred consistency. Serve on top of or next to pork. This recipe was originally created by Susan Rosenberg for the Primal Blueprint cookbook. Thanks, Susan! We loved it !! We hope you enjoy this too- let me know if you make it- I always love to hear it it's a keeper for your family. I'm literally drooling!!!!!!!!! Great food shot! Wow that looks great, I love pesto!! UMMM - YES PLEASE!!! 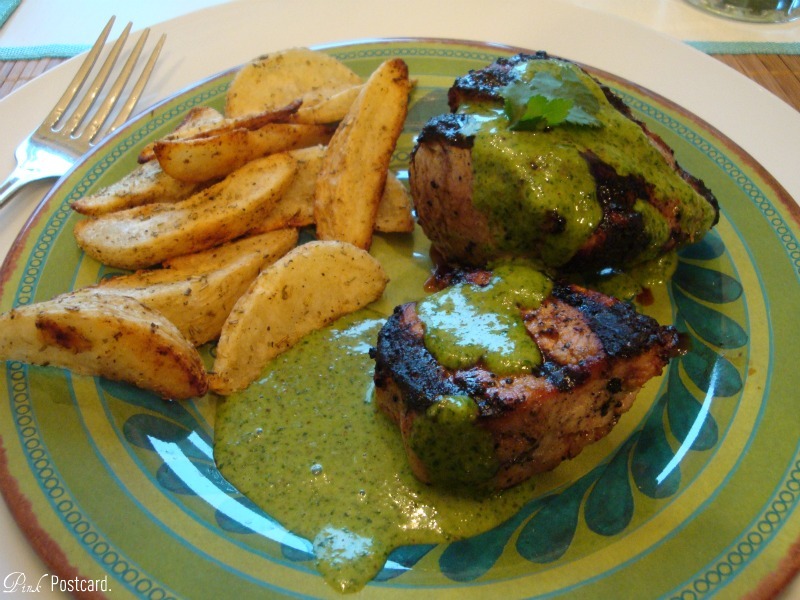 That cilantro pesto looks amazing...I think I need to make me some and slather it all over the potatoes! Thanks for linking up to Foodie Friday! If you haven’t already, make sure to pop back over to enter my GIVEAWAY!!! Entries must be by Sunday evening and a winner will be picked Monday!! I just ate, and yet, that looks so good!! Yum!! Thanks so much for your comments on my projects! I sooo appreciate that.